The large amount of publicly available scholarly data today has allowed exploration of new aspects of research collaboration, such as the evolution of scientific communities, the impact of research groups and the social engagement of researchers. In this paper, we discuss the importance of characterizing the trajectories of faculty members in their academic education and their impact on the quality of the graduate programs they are associated with. In that respect, we analyze the mobility of faculty members from top Brazilian Computer Science graduate programs as they progress through their academic education (undergraduate, master's, PhD and post-doctorate). Our findings indicate that the number of faculty members who are educated abroad are an important indicator of the quality of these graduate programs because they tend to publish more often, and in higher quality venues. In recent years, due to the large amount of data publicly available in many digital libraries (e.g., DBLP, IEEE Xplore and PubMed), there has been a great effort to better understand how scientific results have been produced. Traditionally, such initiatives have addressed comparative analyses involving countries, institutions and research groups by using distinct criteria (e.g., bibliometrics, mentored students, social impact, international visibility, etc.). Despite that, recent efforts have exploited new research collaboration aspects, such as the evolution of scientific communities [2, 24], the impact of research groups [26, 29] and the social engagement of researchers (e.g., altmetrics ). However, there are many other aspects that can be considered when analyzing the productivity of research groups. For instance, what is the impact of academic mobility on the quality of such groups? This is an important question underlying decision-making for mobility policies in research groups, particularly in the case of graduate programs. Although impact may be a subjective measure, it can be defined depending on the goals and needs of each program (e.g., intercultural dimensions or technical training). As discussed by Shaikh , impact can be seen as the potential benefits that "immigrant academics" bring with them, since this promotes the knowledge transfer of good practices from multiple scenarios to a local context. In fact, international research collaboration is important in the evolution of science, resulting in a social construction by linking distinct scientific communities [2, 4]. For instance, academic mobility offers the opportunity to build scientific and human capital, contributing to future strong collaborations . Here, we are interested in analyzing graduate programs based on a social perspective by exploring the Geography of Science . Therefore, academic mobility can be seen as linking different parts of a network, i.e., building bridges with a potential of knowledge transfer [11, 30]. We adopt the concept of social capital, which is the advantage created by a good location in a social structure that explains the importance of sharing information between entities located in different places. By exploring the links outside of a group, Guimerà et al. show that a newcomer on the network improves the success of research teams, whereas Kato and Ando  show that when connecting with researchers outside the group, the overall research performance is improved. Thus, in this work we analyze the impact of academic mobility on the quality of graduate programs. Specifically, we consider the top 25 Brazilian Computer Science graduate programs and characterize the academic trajectories of their faculty members. As a result, we show that in the majority of the graduate programs, at least half of their faculty members have obtained a PhD degree from an institution outside Brazil, indicating that external links are an important factor when assessing the quality of the programs. In addition, the impact of the work produced by faculty members with international links is not only bigger in terms of volume, but also with respect to the quality of the publication venues. Overall, this is a preliminary study that contributes to a discussion of the importance of analyzing faculty members' mobility and its impact on the quality of the graduate program they are associated with. Our findings corroborate the idea of employing new indicators instead of using traditional ones (e.g., publication volume and citation count) when assessing the quality of a graduate program. The remainder of this paper is organized as follows. Section 2 reviews related work. Section 3 presents an overview of the data acquisition. Section 4 summarizes the results of our analyses that highlight the importance of academic mobility. Finally, Section 5 presents our conclusions. Research productivity analyses have contributed to understanding the evolution of science and the discovery of new scientific perspectives. Traditionally, such studies apply bibliometric indicators to assess the production of both individual researchers and research groups. These indicators, which are usually based on citation counts, publication volume and some variations, have been extensively criticized, since it would be unfair to assess research productivity from a single bibliometric perspective [3, 13, 15, 20]. For instance, Lima et al. propose a cross-area ranking strategy that projects the researcher's productivity from different areas into the same basis, thus allowing a fairer comparison among them. In contrast, some studies focus on characterizing multiple research facets rather than proposing new research performance indicators [8, 9, 21]. In such a context, Gonçalves et al. identify a few well-defined profiles in Computer Science and characterize scholars in each of them according to their academic features. Based on the idea of exploring multiple facets of research, more recent strategies can be used on distinct scenarios for specific purposes. For instance, Herrmannova and Knoth  propose metrics based on the semantic distance between citing and cited, Alhoori and Furuta  analyze the importance of social media in research activities, and Silva et al. propose a ranking strategy to measure the contribution between communities by exploring a social facet based on acquired knowledge and the sharing of information. The aforementioned studies illustrate the importance of analyzing new features based on social engagement. Regarding the analysis of Computer Science graduate programs, Lopes et al. explore social network properties and propose new metrics based on social activity. Ribas et al. use a Markovian model to quantify and transfer the reputation of external groups to publication venues, and then apply the venues' score to measure the quality of graduate programs. Likewise, Silva et al. propose a strategy for measuring the quality of graduate programs based on the similarity of their publication profile with those of external programs. Here, we do not assess the quality of graduate programs; instead we show that academic trajectories are important for graduate programs, reinforcing the use of this feature in future productivity analysis. Considering the importance of links in a social perspective, Granovetter  proposes the concept of weak ties as the relationship that connects different parts of a network (i.e., builds bridges). Likewise, Freire and Figueiredo  explore external collaborations and identify influential individuals and groups through the intensity of their relationships with individuals outside their groups. Similarly, Silva et al. explore the concept of community to rank publication venues according to the degree of external relationships that connect communities. Like all of the aforementioned works, our study is based on a social perspective, as we are interested in exploring the links existing outside of a group (i.e., scholars with international academic trajectories). Regarding the importance of Geography of Science as a means to improve the relationship between entities located in different places , some studies analyze the role played by geography in scientific activities. For instance, Furtado et al. analyze the career trajectories of researchers from main Brazilian research groups, whereas Kato and Ando  show that international collaborations between researchers improved science in Chemistry. Likewise, we contribute to this discussion by highlighting the importance of analyzing the mobility of faculty members and the impact of that mobility on the graduate program to which they are associated. A good profile analysis depends on high-quality data from reliable sources. However, collecting and merging data from multiple sources is a challenge , since it requires dealing with problems such as name disambiguation  and incomplete data . Here, we combine data from different sources in order to better characterize academic mobility and provide insights about its importance to the quality of graduate programs. Next, we detail the main steps taken for building our dataset (see Figure 1). Figure 1: Overview of the process of data acquisition. First, we collected the list of faculty members from CAPES, publications from DBLP and personal information from the Lattes platform. 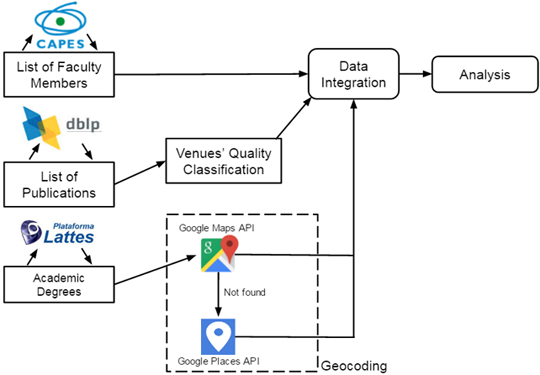 Then, we geocoded addresses using Google services and applied a publication venue classification scheme. Finally, we integrated the data from all sources and performed our mobility analysis. Step 1: Graduate programs and faculty members. There are 68 Computer Science graduate programs in Brazil, 21 of which award PhD degrees (CAPES Triennial Evaluation 2010-2012). Graduate programs are classified by CAPES (the Brazilian Ministry of Education agency in charge of supporting and evaluating graduate programs) in ranks from 3 to 7, where those programs ranked 6 and 7 are considered to be of high excellence. We decided to focus our analysis on the programs ranked 4 and higher, because those ranked 3 correspond in general to recently created programs and, therefore, there is less information about their performance. The list of graduate programs with their faculty members was obtained from CAPES. Table 1 lists basic statistics on the 25 graduate programs considered in this work and their respective ranks. Table 1: Statistics of the graduate programs and their CAPES ranks. Step 2: Publication dataset. Using the list of faculty members from each program, we then collected their publications from DBLP, the main Computer Science Digital Library. We assumed that author name variations (synonyms) had been solved by DBLP, whereas distinct authors with similar names (polysems) were manually resolved by us. The matching process resulted in a total of 691 faculty members. Step 3: Publication venue classification. For classifying the quality of the publication venues, we used Qualis, a CAPES ranking that rates publication venues according to seven tiers: A1, A2 and B1 to B5 (being A1 the top quality tier). For venue matching, we used their titles, acronyms and ISSN (only for journals). Step 4: Faculty members' profiles. Additional information about the faculty members, such as the year and place where they obtained their academic degrees, were extracted from their personal curricula vitae stored on the Lattes Platform, an internationally renowned initiative for managing information about individual researchers and research institutions in Brazil . Step 5: Geocoding. In this step, we assigned a geographic location to each institution from which the faculty members obtained a degree. For this, we first submitted the institution's name or address to the Google Maps API. If no result was returned, a new query was posted to the Google Places API. Since the content of the Lattes curricula is filled out by the researchers themselves, institution name variations occur, resulting in wrong locations due to data ambiguity and incompleteness. 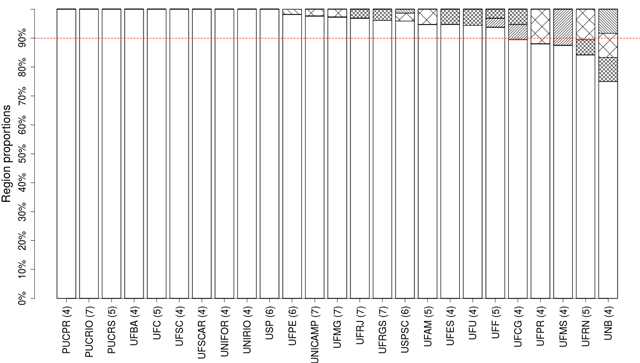 Such inconsistencies were manually removed from our dataset. As a result, 94% of all locations were correctly extracted and 352 different geographic places were identified. The resulting dataset contains information on graduate programs, their faculty members, the places where they obtained their academic degrees, their list of publications, and the Qualis classification of each publication. The next section describes the results of our analysis of this dataset. Studies in Social Sciences emphasize the importance of people who potentially make a network stronger by linking different parts of it (i.e., people who build social capital) . As discussed in Section 2, several studies confirm the importance of this social concept by applying it to academic social networks [7, 11, 14, 28, 30]. In the context of academic mobility, we consider a graduate program as a closed group with a set of faculty members. A link in the network of such groups is created when a faculty member from one group gets an academic degree from another group. We are interested in characterizing the mobility of faculty members from Brazilian Computer Science graduate programs with respect to the world region where they obtained their academic degrees. Particularly, we aim to characterize the mobility of faculty members in terms of their academic degrees (undergraduate, master's, PhD and post-doctorate. Although a post-doctorate stage does not lead to any formal academic degree, for the purpose of this work we do not make this distinction). For this, we grouped the institutions where the faculty members obtained their academic degrees in five regions: US+CA (United States and Canada), Europe (15 countries), Latin America (5 countries), Asia (4 countries) and Oceania (only Australia). We did not consider Africa because we found only one faculty member who got a degree in that region. Next, we first analyze the distribution of the academic degrees over the geographic regions for the faculty members of each graduate program (Section 4.1) and for the programs grouped according to the CAPES ranking (Section 4.2). Then, we present a cumulative analysis (temporal evolution) based on the geographical origin of the faculty members' degrees (Section 4.3). Finally, we investigate the impact of mobility on the faculty members' productivity based on the quality of their publications (Section 4.4). The graphics in Figure 2 show, for each type of academic degree, the percentage of faculty members from each graduate program who got a degree from an institution in each geographic region. As we can see, undergraduate degrees (Figure 2 (a)) have been mostly obtained in Brazil, with only five graduate programs having at least 10% of their faculty members having graduated abroad. The University of Brasília (UNB), ranked 4, stands out by achieving 25%. The scenario for master's degrees (41 faculty members (5.9% of the total) do not have a master's degree recorded in their Lattes CV, indicating a direct step from an undergraduate degree to a PhD) (Figure 2 (b)) is similar, but with a slight reduction in the percentage of Brazilian degrees. Nevertheless, for foreign degrees, there is a clear predominance of degrees obtained from North American (US+CA) and European institutions. Again, UNB is an outlier with more than 40% of its faculty members having obtained a master's degree outside of Brazil, most of them from Asian institutions. Figure 2: Geographic origin of academic degrees by graduate program. Focusing on PhD degrees (two faculty members do not have a PhD degree recorded in their Lattes CV), Figure 2 (c) shows that the percentage of degrees obtained abroad is in general high, with many programs having more than 50% of their faculty members having a PhD conferred by a foreign institution. The exceptions are the UNIRIO and UFSCAR programs, both ranked 4 by CAPES, for which the majority of their faculty members (93.0% and 90.6%, respectively) obtained a PhD degree in Brazil. Likewise, for master's degrees, when we consider only PhD degrees obtained outside Brazil, the majority are from European and North American (US+CA) institutions, with UNB having a significant percentage of their faculty members with a PhD from Asian institutions (we have found no specific reason for this fact). However, the PUCRIO, UNICAMP, UFMS, USP and UFMG programs have a larger percentage of their faculty members with PhD degrees from North American institutions. 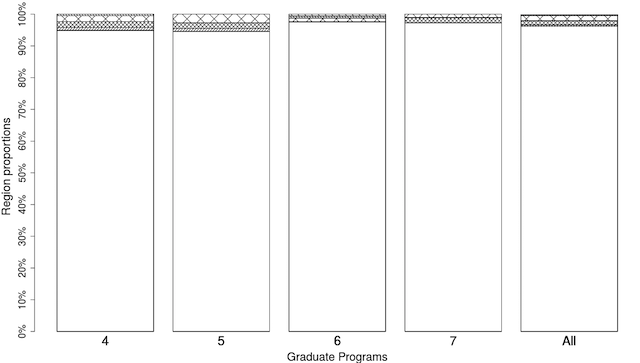 Regarding post-doctorate stages, Figure 2 (d) shows the percentage bar sizes limited according to the percentage of faculty members from each graduate program that have included such information in their Lattes CV. For instance, in the UFMS program 77.8% of the faculty members held a post-doctorate position, most of them in North American (US+CA) institutions. Overall, considering all graduate programs, at least 10% of their faculty members have reached a post-doctorate stage. On average, this figure reaches 42%, with the majority of the post-doctorate stages having been carried out outside Brazil. Finally, we notice that the percentage of post-doctorate stages in European institutions is still high, but with a lower preponderance when compared to PhD degrees (Figure 2 (c)). In summary, although most faculty members obtained their undergraduate and master's degrees in Brazil, this scenario does not hold true for the more advanced education stages, which have been mostly carried out abroad. These results are in accordance with conclusions from Furtado et al. , who observed the same pattern for top Brazilian research groups from other fields of knowledge. 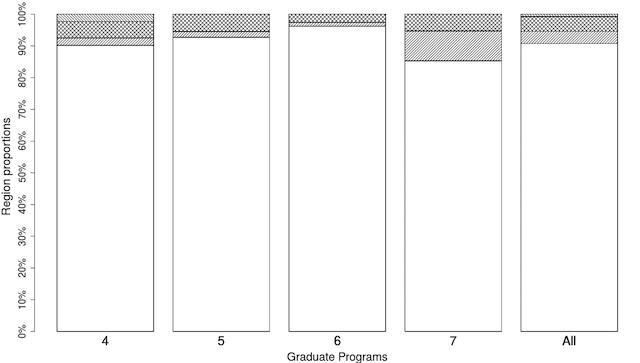 Figure 3 shows the percentages of degrees from each region, grouping faculty members according to the CAPES rank of their graduate programs. 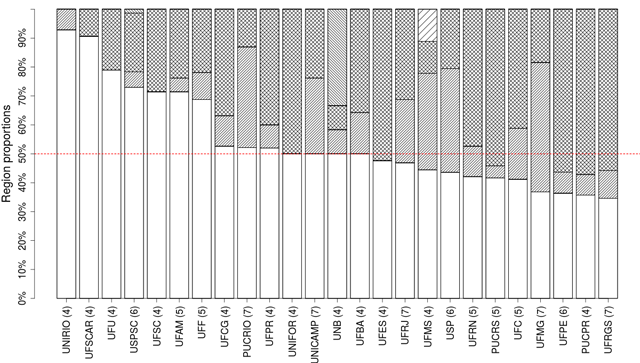 Again, the percentage of undergraduate degrees from non-Brazilian institutions is very small (Figure 3 (a)). In the case of master's degrees (Figure 3 (b)), the percentage of degrees obtained outside Brazil is larger for faculty members from CAPES rank 7 programs (total of 14.7%), followed by those from rank 4 programs (total of 9.9%). Notice that for CAPES rank 7 programs the percentage of degrees from North America (US+CA) is greater than those from Europe. However, when we consider the programs altogether (most right bar) the situation is the opposite, with more degrees from Europe than from North America. 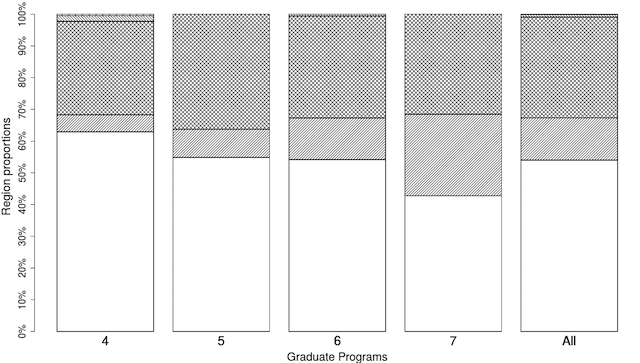 Figure 3: Percentage of academic degrees from each geographic region for graduate programs grouped by CAPES ranks. 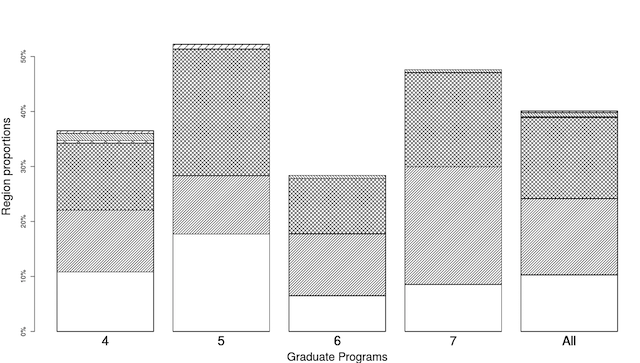 Figure 3 (c) shows that CAPES rank 7 programs are those with the highest percentage (57.2%) of faculty members with PhD degrees obtained outside Brazil, followed by programs ranked 6 (45.8%), 5 (45.1%) and 4 (37.1%). 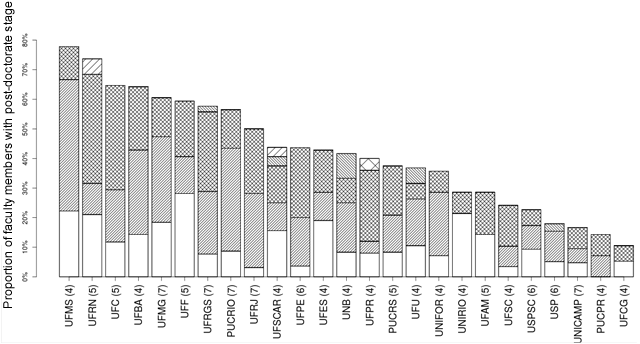 Considering the programs altogether (most right bar), faculty members with PhD degrees obtained outside Brazil correspond to 46.0% of the total. Notice that, in this stratum, the percentage of faculty members with European PhD degrees is higher than those with a degree from North America. Finally, considering post-doctorates (Figure 3 (d)), our results show that, for all graduate programs (most right bar), 40% of the faculty members have pursued such a stage, 75% of which were outside Brazil. For CAPES rank 7 and 5 programs this percentage is even higher, although for rank 6 and 4 programs it is lower. Notice also that for CAPES rank 7 and 6 programs, still considering post-doctorates, the number of stages in North America is higher than those in Europe, which is coherent with the fact that most faculty members have got their PhD degrees from European institutions and, therefore, had already a research experience in that region. Overall, our results show that only a very few faculty members from the Brazilian graduate programs obtained their undergraduate degree or even their master's degree from an institution outside Brazil. In fact, a large number of them have completed their PhD programs, or even their post-doctorate studies, in a foreign institution. Faculty members that have carried out at least one stage of their academic careers out of their home country are likely to create links with faculty members from their hosting institutions, thereby establishing academic bridges and reinforcing the social capital effect [10, 28]. In fact, faculty members associated with the top graduate programs have more frequently obtained higher degrees abroad than in Brazil. Grouping them by the CAPES rank of their graduate programs confirms this tendency, with the best graduate programs having a larger percentage of their faculty members with PhDs obtained from an international institution. Figure 4 shows the cumulative percentages of PhDs in each region over the period considered in this study ([1970, 2015]). As we can see, the share of faculty members with an international degree is higher in those programs with higher CAPES ranks. As for the temporal evolution of the number of degrees in each region, we notice that earlier degrees (between 1970 and 1980) have mostly been obtained abroad. In fact, most of these faculty members are among the founders of their respective programs, which, thereby, benefited from their international experience and networking. The remaining faculty members educated in Brazil in this initial period come from correlated areas (e.g., Engineering and Mathematics). Also note that the percentages tend to stabilize around 2010, when almost all faculty members are included in the cumulative analysis, reflecting an increasing and then predominant share of Brazilian degrees. 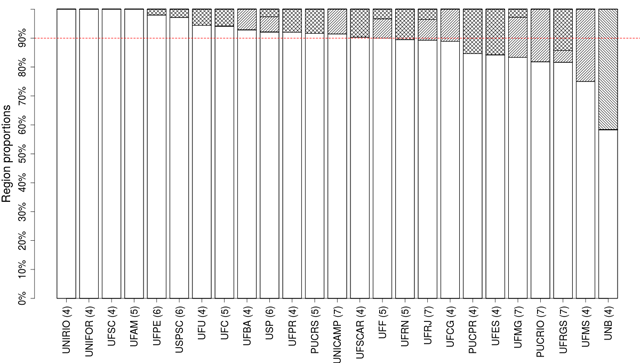 Figure 4: Cumulative percentages of PhD degrees obtained in each region over time, normalized by the number of faculty members in each group. Considering the percentages of international (European and North American) and Brazilian PhD degrees over the years, we can clearly see that CAPES rank 6 and 7 programs have higher percentages of their faculty members having graduated abroad, particularly before the year 2000. 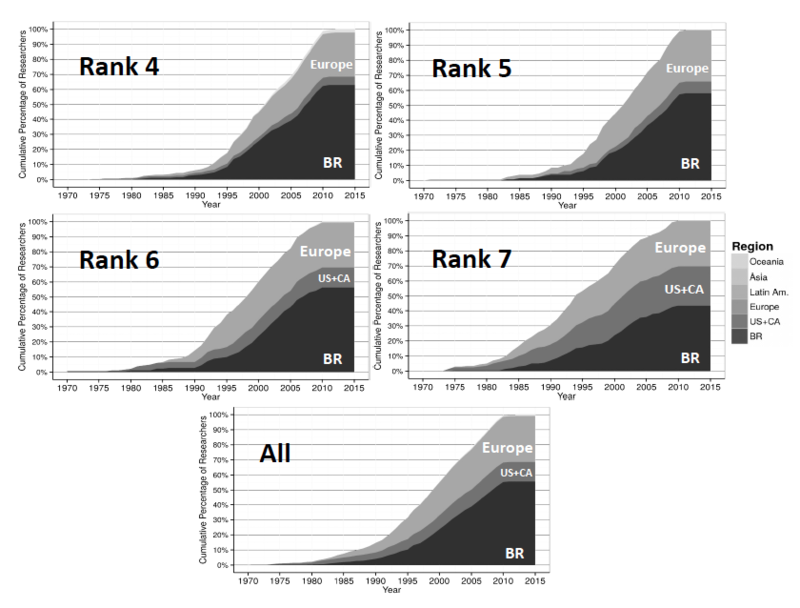 In addition, over the years, European degrees have a higher percentage than North American ones, except for CAPES rank 7 programs, for which this difference is slightly lower. Overall, there is an intrinsic relationship between the programs' rank and the percentage of their faculty members with internationally obtained degrees. However, the number of faculty members with such degrees has been diminishing over the last decade, as a consequence of the consolidation of the Brazilian programs. Thus, in order to strength the Brazilian scientific system, it is very important to invest in the internationalization of the programs to specifically support those faculty members who obtained a PhD degree from a local institution. Herrmannova and Knoth  and Silva et al. argue that the quality of a work is given by its content, and is not adequately assessed by simply applying bibliometrics. Accordingly, our intention here is to characterize the correlation between experience acquired through mobility and productivity, and not to assess the scientific production of the graduate programs. In addition, impact is a subjective measure and depends on the goals and needs of each graduate program. Thus, we define impact as the potential benefit that academic mobility brings in terms of productivity, considering the quality of the publication venues. In order to measure such an impact, we divided the faculty members into two groups: those who got their PhD degrees from Brazilian institutions (group B), and those who were educated abroad (group A). As described in Section 3, we classified the publications authored by faculty members according to the Qualis rank of their venues (A1, A2, B1-B5). Moreover, to avoid overestimating the impact of a work with many authors , we divided its influence equally among them (e.g., a work with 10 authors contributes with a fraction of 1/10 of its impact to each author). Figure 5 shows the average number of publications per faculty member in each group, considering the full time range (1970-2015) and the last ten years. Based on the total number of publications (Figure 5 (a)), faculty members from group A have an average publication rate higher than those from group B. Furthermore, on average, they publish more in the best qualified venues (ranked A1, A2 and B1). Although these differences have decreased in the last ten years (Figure 5 (b)), the higher means are still noticeable. 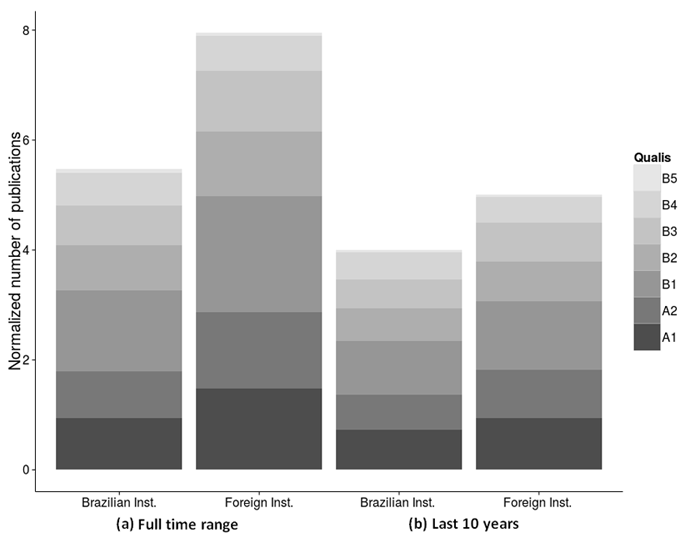 Figure 5: Distribution of the total number of publications grouped by the Qualis rank of their venues, per faculty member educated in Brazilian and foreign institutions, considering time ranges (a) 1970-2015 and (b) 2006-2015. For further comparison, we applied a weight to the number of publications in each Qualis stratum, as proposed by Digiampetri et al. , namely: A1 = 100, A2 = 85, B1 = 70, B2 = 50, B3 = 20, B4 = 10 and B5 = 5. We adopted a level of significance = 0:05. Considering the entire time interval, faculty members from group B achieve a mean of 388.4 with a confidence interval (CI) of (343.3, 433.5), whereas faculty members from group A achieve a mean of 546.9 with a CI of (476.5, 617.3). Since the CIs do not overlap, there is a statistical distinction between the two groups. Narrowing the time range to the last 10 years, the means and the CIs are, respectively, 282.5 and (251.0, 313.9) for group B, and 339.9 and (294.4, 385.3) for group A. Since the CIs now overlap, we applied a Student's t-test, which reported a significant difference. Therefore, in both time ranges the scientific production by faculty members who got their PhDs abroad can be statistically considered of higher quality. Analyzing the production of the faculty members from groups A and B according to the CAPES rank of their respective programs, there is no significant difference between the two groups when we consider both time ranges. The only exception is when we consider the production of the faculty members from ranked 7 programs on the entire time range, whose members in B achieve a mean of 591.0 and CI of (447.4, 734.7), whereas those in A achieve a mean of 835.3 and CI of (695.8, 974.9). Finally, as pointed out by Laender et al. , Brazilian Computer Science programs share many similar characteristics with top international programs, such as their overall productivity and the number of PhD students mentored per faculty members. Thus, the increasing maturity of the Brazilian programs explains the reduction of the difference among the programs in the last ten years. Besides, the programs have also become increasingly more attractive, as they are now more mature and the quality of their education has increased. In this paper, we discussed the importance of characterizing the trajectories of the academic pursuits of faculty members. We analyzed the trajectories of faculty associated with the top 25 Brazilian graduate programs, grouping them according to the CAPES ranking. Overall, our results indicate that higher education studies undertaken abroad by faculty have a significant and positive impact on the quality of the faculty members' associated graduate programs, i.e., the highest ranked programs have a large percentage of faculty members educated abroad. In addition, what faculty members with international educations publish tends to be more highly regarded, and found in more prestigious conferences and journals. Finally, from a social perspective, our results reinforce the notion that faculty members with international links have advantages in the academic social structure, and this advantage also positively impacts the quality of their publications. Our observations also corroborate the premise that knowledge acquired from external groups tends to improve scientific results [14, 23, 28, 30]. This research is funded by projects InWeb (MCT/CNPq grant 573871/2008-6) and MASWeb (FAPEMIG/PRONEX grant APQ-01400-14), and by the authors' individual grants from CAPES, CNPq and FAPEMIG. M. S. Granovetter. The strength of weak ties. American Journal of Sociology, pages 1360-1380, 1973. D. Hicks, P. Wouters, L. Waltman, S. de Rijcke, and I. Rafols. The Leiden Manifesto for research metrics. Nature, 520:429-431, 2015. G. R. Lopes, M. M. Moro, R. da Silva, E. M. Barbosa, and J. P. M. de Oliveira. Ranking Strategy for Graduate Programs Evaluation. In Proc. of ICITA, pages 253-260, Sydney, Australia, 2011. H. A. Mooney, A. Duraiappah, and A. Larigauderie. Evolution of natural and social science interactions in global change research programs. Proceedings of the National Academy of Sciences, 110(1):3665-3672, 2013. S. Shaikh. A survey of migration of academics in higher education and their impact on host institutions. Reflecting Education, 5(1):16-30, 2009. T. H. P. Silva, L. M. A. Rocha, A. P. C. da Silva, and M. M. Moro. 3c-index: Research Contribution across Communities as an Influence Indicator. Journal of Information and Data Management, 6(3):192, 2016. Thiago H. P. Silva is a PhD student in Computer Science at Universidade Federal de Minas Gerais (UFMG), Brazil. He holds MSc and BSc degrees also in Computer Science from UFMG (2015 and 2013, respectively). His research interests include data science, social networks, and social computing in general. He is particularly interested in characterizing and modeling social networks based on social science concepts. Alberto H. F. Laender is a Professor of Computer Science at the Universidade Federal de Minas Gerais (UFMG), Brazil, where he leads the Database Research Lab. He holds a PhD in Computing (1984) from the University of East Anglia, UK, and an MSc in Computer Science (1979) from UFMG. His research interests include databases, web data management, digital libraries and bibliometrics. Prof. Laender is a member of the Brazilian Academy of Sciences and of the Brazilian National Academy of Engineering. Clodoveu A. Davis Jr. is an Associate Professor at the Computer Science Department of the Universidade Federal de Minas Gerais (UFMG), in Belo Horizonte, Brazil. He holds a PhD (2000) and an MSc (1992) in Computer Science from UFMG, and is also a civil engineer (UFMG, 1985). His main research interest subjects include spatial databases, spatial data infrastructures, geographic information systems (GIS), geoinformatics, geographic data modeling, geocoding and urban computing. Ana Paula Couto da Silva is an Associate Professor at the Computer Science Department of the Universidade Federal de Minas Gerais, in Belo Horizonte, Brazil. She earned her PhD degree in Computer and Systems Engineering from the Universidade Federal do Rio de Janeiro. She was with IRISA-Rennes in 2005 and 2007 as a post-doc, and with Politecnico di Torino in 2008 as a post-doc and in 2010, 2011 and 2016 as a visiting fellow. Her research interests include modelling and analysis of computer systems, characterization of Internet traffic and complex network theory. Mirella M. Moro is an Associated Professor in the Computer Science department at UFMG (Belo Horizonte, Brazil). She holds a Ph.D. in Computer Science (University of California Riverside, 2007), and an MSc and a BSc in Computer Science as well (UFRGS, Brazil, 2001, 1999). She is a member of the ACM Education Council and was the Education Director of SBC (Brazilian Computer Society, 2009-2015). Her research interests include query optimization, stream processing, hybrid XML/relational modeling and social networks.